I might have screamed out loud mentioned that I will be going to the Snowmass Culinary and Arts Festival next weekend. Geographically near the more well known Aspen Food and Wine Classic that is held earlier in the summer, it is an event that is coming into it’s own. The event is held in Snowmass Village from Thursday thru Saturday, July 21-23. Thursday evening kicks off the beginning of the event with a Sunset Art Show as well as a celebrity chef demo with Personal Chef Diane Henderiks and Venga Venga’s Chef Barry. Chef Barry will prepare one of Venga Venga’s most popular dishes, Jalisco Shrimp Enchiladas. Nutritionist Diane Hendricks will adjust the recipe with healthy components and members of the audience with do a ‘blind taste test.’ I’m volunteering right now if anyone’s interested! When I was invited to attend, interview chefs and write about the experience, I’ll be honest, I didn’t know who would be there or exactly what the event included. At that moment it simply meant getting away to the gloriousness that is summer in the mountains of Colorado and I was thrilled even if it meant combining some work with play. Work meaning interviews with some of the celebrity chefs who are attending; if that’s work then I should not be so excited! I’m hoping to come away with some personal asides that I’ll share with you in a post event wrap-up. Only the second year for the Festival; it features celebrity chefs, a juried art exhibit with regionally and nationally recognized artists, food and presentation expert panels and a highlight of the event, the Palette of Pairings which includes an array of artisan crafted dishes. This event features specialty foods prepared by restaurants and chefs, individually paired with a variety of fine wines, spirits, and beers. There will be over 40 samplings of different foods and 100 different varietals of wine and spirits, certainly something for everyone. 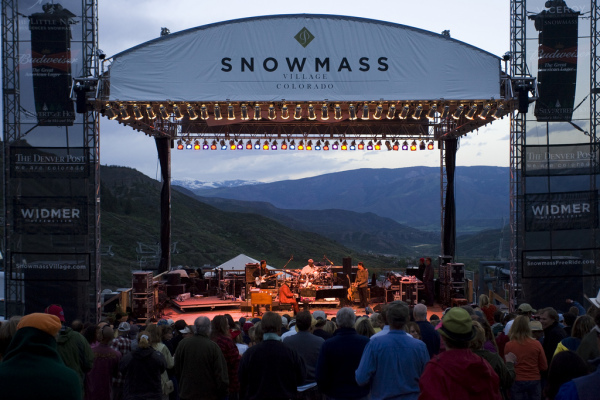 If you’re coming this way or live in Colorado and want to attend this years Snowmass Culinary and Art Festival, you can buy your tickets online. I hope to see you there. I’m the really tall girl with a camera. Workshops, panel discussions and the Palate of Pairings are included in the $65 advance ticket. The artist exhibition is free. This year the festival features three executive chefs with both local and national recognition. Chef Richard Sandoval: Restaurateur of the Year by Bon Appétit in 2006, one of the Best Chefs of 2003 by New York magazine, and Mexican Chef of the Year by the National Toque d’Oro in 1992. Originally from Mexico, Chef Sandoval’s earliest influences were French cuisine. He soon returned to his Latin roots and as Chef and Owner of Richard Sandoval Restaurants, now leads an international restaurant group with more than a dozen locations, including Venga Venga in Snowmass where he will be in attendance for the Tapas and Tequila pairing event he’s hosting on Friday. (4 p.m. to 5 p.m.; for reservations 970-923-7777). Chef Sandoval along with Chef Diane Henderiks will host a ‘Market Foods of Mexico’ demonstration as well on Saturday at 2:30 p.m. Chef Hosea Rosenberg: Bravo TV’s TOP CHEF 2009 Winner, Best Chef of Denver International Wine Festival (2006, 2007, 2008); seven-time, undefeated winner of the Flatiron Chef Competition; Guest Chef at the James Beard House (2007), NYC, 1994-2009 Best Seafood Restaurant, Jax Fish House. 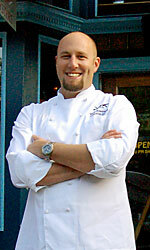 Though some pit Denver against Boulder in their own version of Restaurant Wars, when Chef Rosenberg won Top Chef 2009; he was considered ‘our’ hometown favorite, the representative from Colorado. I was impressed with his demeanor then and hear he’s not changed. Accessible and fun, he moved on from the Jax Fish House in Boulder to starting a food truck business; talk about someone jumping off the curb and landing on a trend. Latest news is that Boulder regulatory snafus have sidelined the business and that Rosenberg is looking again at a brick and mortar restaurant. I’m slated to be a part of a roundtable interview on Saturday; I’ll not leave without the skinny on that! I’m excited about seeing his ‘Smoking at Home‘ demonstration on Saturday morning, especially since participating in #charcutepalooza and smoking my own Maple Bourbon Bacon! 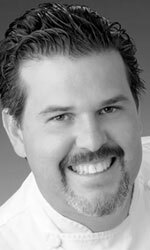 Chef Alex Seidel: Named by Food and Wine Magazine as one of its 2010 “Best New Chefs in America” , “Chef of the Year” in Denver magazine in 2009 and by 5280 magazine in 2008, Nationally recognized Fruition Restaurant as “One of Top 10 New Restaurants” in America in 2007. 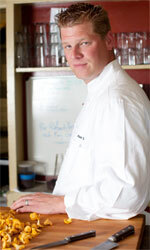 Born in Wisconsin, trained in Portland and schooled in California, Chef Seidel landed in Colorado and found his home. Famed for his innovative use of fresh, seasonal products, he walks that walk as Chef and proprietor of Fruition. In May 2009 Seidel purchased a 10 acre farm in Larkspur, CO that produces fruits and vegetables for Fruition and many other top-tier restaurants in Denver. The farm is also home to a flock of forty milking sheep, milked twice daily to produce Colorado’s first artesian sheep’s milk cheeses. Pigs, chickens and bees are also a part of the farm and are used to help educate Seidel’s staff about proper techniques in creating several types of farm raised products. I wanted to include a recipe from one of the chefs in this post but getting through channels in time (that’s what success brings you; channels!) became problematic so I decided to find something online. 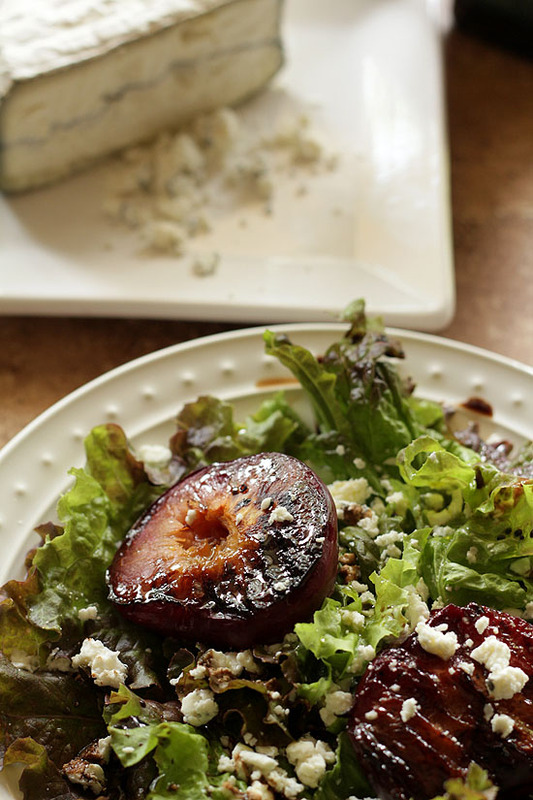 With time at a premium this late in the schedule, limited ingredients in my pantry and Goaterie on my mind, I found this video for a grilled plum salad from Chef Rosenberg. Can you say simple? I had plums I had been thinking of grilling for a dessert, a fabulous Goat cheese from Cypress Grove Chevre and, well, if not mache, some pretty greens. Easy and delish. 2-3 ozs goat cheese - I used the Humboldt Fog cheese I received from the kind folks at Cypress Grove Chevre. Humboldt Fog is an elegant, soft, surface ripened cheese with a subtle tang. Perfect for pairing with fruit. Heat grill for 5 minutes on high. Cut plums in half and remove seed. Put on skewer. I like to skewer foods for the grill on two skewers to make it easier to turn food over without them flipping all over the place. Grill for approximately 2-3 minutes per site until you can see discernable grill marks. For a salad like this, I don't bother using another utensil to mix the olive oil and vinegar; just sprinkle some on top of lettuce and fruit; keeping approximately 3 to 1 ratio of oil to vinegar. Crumble goat cheese on top, salt and pepper to taste. When I have more time; this recipe on Food & Wine is next: Warm Chocolate Cakes with Marscarpone Cream. Epitomizes To. Die. For. doesn’t it? Hope you enjoy and also hope to come back with some great information. Have any questions you are dying to know the answer to? Let me know in comments, I’ll see what I can do! I want to go next time. Fabulous! I want you to; you’re on the list now girl! Ain’t it all better with chevre? Seriously. So very cool. Why yes it is Mr. Goat Man hisself! I appreciate your goat cheese recipes! We have a friend 15 minutes from here with a herd of goats and a dairy and I love her goat cheese. Will have to try this one, too. I’m sort of nuts about using it lately; just did a goat cheese risotto today. Soooo good! What a beautiful, simple salad. Now this is the way to do summer! I’m looking forward to reading your posts about the festival – so glad you’re going. As hot as it’s been, salads have been my mainstay the past couple of days. Especially really SIMPLE ones. And thanks Dara…I’m giddy as a schoolgirl at the thought of getting away. To the mountains. From the heat. And well, not a bad little festival to ‘have’ to partake in! I’ll do my best. have a killer recipe from a demo on Saturday that I’ll be sharing. Drat! Tell you what? You get the G6 back in action…I’ll make the plans. Deal? This is so my kind of salad – may just have to do as you did and make this for lunch later this week!! I am so EXCITED for you – can’t wait to hear about your experience!! Salad was about as easy as it gets and also as good. And thanks so much Nancy; I know you are and that means the world to me. Sounds like a fantastic event! We had dinner this weekend at La Sandia and would LOVE to meet Richard Sandoval. I just might have to take a drive to beautiful Snowmass! Oh, did you mention this to me? I can’t remember…. LOL! Sounds and looks fabulous, lucky you! I wish I could go with you but will have to settle for the recap, interviews and recipes! This particular recipe is screaming my name!!! Wow! Fruit and goat cheese on a salad? Grilled plums? Gorgeous, Barbara, just gorgeous! A great festival! I wish we had that kind of event here. A delightful and refined salad! This look like the place to be, enjoy it! Can’t wait to hear all about it. I hope to meet you there, I’ll be attending on Saturday. Cheers! Oh wow. What a great write up. I have plans already for this coming weekend or I’d go. So I’m calendaring this for next year. We can do a meet up and maybe some other bloggers will join us! Looking forward to it. Gorgeous Barb! Perfect post and such a nice addition to share this beautiful recipe. I can think of a handful of food photo websites that will be happy to get their mits on the last photo too! So looking forward to sharing the time with you later this week! Me too…starting to seem real now. I can’t wait! And thanks as always for the kind words…you know how this was thrown together; that it looks edible is all that matters right now. I had what I photographed for lunch; turns out to have been the perfect choice. What a fun experience this will be for you. I can’t wait to read your recap of the event. I’m so looking forward to it. Hope I have some fun things to recap for everyone!